The U.S. Geological Survey conducted an assessment of resources associated with porphyry copper deposits in the western Central Asia countries of Kyrgyzstan, Uzbekistan, Kazakhstan, and Tajikistan and the southern Urals of Kazakhstan and Russia as part of a global mineral resource assessment. The purpose of the study was to (1) delineate permissive areas (tracts) for undiscovered porphyry copper deposits; (2) compile a database of known porphyry copper deposits and significant prospects; (3) where data permit, estimate numbers of undiscovered deposits within those permissive tracts; and (4) provide probabilistic estimates the amounts of copper (Cu), molybdenum (Mo), gold (Au), and silver (Ag) that could be contained in those undiscovered deposits. Western Central Asia, a region diverse in its geologic complexity, is situated north of the Tarim and North China tectonic blocks and sandwiched between the East European and Siberian cratons. The Ural Mountains form the western margin of the region; the southern margin is formed by the high-standing ranges that make up the Tian Shan mountain range in the border regions of Kazakhstan, Kyrgyzstan, and western China, where the effects of collisional tectonics are well displayed. The tectonic collage that makes up the core of western Central Asia is perhaps the geologically least understood part of the region. There is broad agreement that the early Paleozoic is made up of tectonically juxtaposed blocks that vary from Precambrian-cored microcontinents to magmatic arc and related complexes to subduction-related accretionary complexes. The rudiments of an incipient, contiguous single Kazakhstan block were formed by the end of the Silurian. In the middle to late Paleozoic, the block was unconformably superposed by two large, nested magmatic-arc belts, one Devonian, the other Carboniferous. Both magmatic-arc complexes were folded into a horseshoe-shaped, southeast-opening orocline in response to the final collisions of the various surrounding cratonic blocks with the Kazakhstan block. Additional deformation in the upper Cenozoic derived from the collision of India and China significantly redistributed fragments of the various mosaicked blocks, particularly in the central and southern parts of the western Central Asian region. Porphyry copper deposits are associated with many of the magmatic-arc fragments and belts throughout the geologically complex region, and economically important deposits are found in arc sequences of all Paleozoic Periods. The economically most productive arcs are Carboniferous. 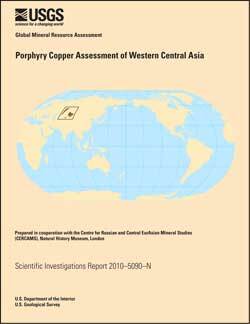 The assessment includes a discussion of the tectonic and geologic setting of porphyry copper deposits in western Central Asia (chapter 1), an application of remote sensing data for hydrothermal alteration mapping as a tool for porphyry copper assessment in the region (chapter 2), and a probabilistic assessment of undiscovered porphyry copper resources in four areas that represent Ordovician and Late Paleozoic (Carboniferous-Permian) magmatic arcs (chapter 3). The principal litho-tectonic terrane concept used to delineate permissive tracts was that of a magmatic arc that formed in the subduction boundary zone above a subducting plate. Eight permissive tracts are delineated on the basis of mapped and inferred subsurface distributions of igneous rocks assigned to magmatic arcs of specified age ranges that define areas where the occurrence of porphyry copper deposits within 1 kilometer of the Earth’s surface is possible. These tracts range in area from about 8,000 to 200,000 square kilometers and host 18 known porphyry copper deposits that contain about 54 million metric tons of copper. Available data included geologic maps, the distribution of significant porphyry copper occurrences and potentially related deposit types, the distribution of hydrothermal alteration patterns that are consistent with porphyry copper mineralization, and information on possible subsurface extensions of permissive rocks. On the basis of analyses of these data, the assessment team estimated a mean of 25 undiscovered porphyry copper deposits for the study area. Estimates of numbers of undiscovered deposits were combined with grade and tonnage models in a Monte Carlo simulation to yield a mean estimate of 95 million metric tons of copper in undiscovered porphyry copper deposits; this represents about twice the amount of identified porphyry copper resources (54 million metric tons). Detailed descriptions of each permissive tract, including the rationales for delineation and assessment, are given in appendixes, along with a geographic information system (GIS) that includes permissive tract boundaries, point locations of known porphyry copper deposits and significant occurrences, and hydrothermal alteration data based on analysis of remote sensing data. Plates from the report are available in low-resolution (smaller file size) and high-resolution (larger file size) formats. Right-click, use "save link as" to avoid opening file in browser window. Berger, B.R., Mars, J.C., Denning, P.D., Phillips, J.D., Hammarstrom, J.M., Zientek, M.L, Dicken, C.L., and Drew, L.J., with contributions from Alexeiev, D., Seltmann, R., and Herrington, R.J., 2014, Porphyry copper assessment of western Central Asia: U.S. Geological Survey Scientific Investigations Report 2010–5090–N, 219 p., 8 plates, and spatial data, http://dx.doi.org/10.3133/sir20105090N.